The RALLY TIMER I is a unique watch from the house of ELYSEE. Designed for regularity tests in rally sport. As on well-known stop watches the pushers are located on the upper edge of the case. The bezel is moved so that the remaining time of a rally regularity test can be set precisely to the second. The chronograph movement does not only show the seconds, it also displays the time at 1/20 second intervals and, close to the 4 oclock position, the date can be read. A sapphire glass lens has been included to protect this superb watch. The floor of the case is screwed in and thereby guarantees water resistance of 10ATM. For night-time driving this model has a super luminous dial and therefore perfectly legible in all situations. In this watch a Citizen / Miyota 6S20 is used as movement. This “marking” of German products was used to protect consumers in Great Britain at the end of the 19th Century from supposedly poor quality imported goods. The World Exhibition in 1862 in London, among other things, however contributed to the transformation in the way people judged goods made in Germany into quite the opposite. Today “Made in Germany” is recognised worldwide as a seal of good quality. The technical group for “Watches” at the Federal Association for Jewellery and Watches has made a point of enabling customers to have better visibility of this quality. Right at first glance it should be clear which watches are “Made in Germany”. To this end it created its own recognisable seal of quality. Manufacturers, who want to be able to identify their watches with the “Made in Germany” mark, must comply with the strict quality standards of the Federal Association for Jewellery and Watches. Only then will the Association award the mark. 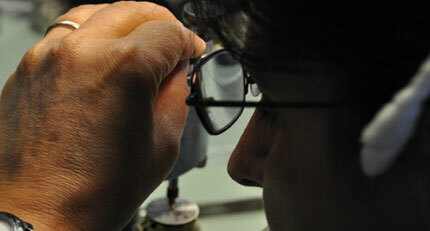 The watch manufacturers for their part commit to maintaining the quality of their watches and upholding all standards. Every watch brand that bears the “Made in Germany” logo is registered in Germany. For quartz watches an additional EAR (electrical and electronic equipment) registration is available. Design, product development, final assembly and quality control take place in Germany. In this way we ensure enduring quality and secure jobs in Germany. As there are currently no watch movements manufactured in Germany readily available on the market, it is permitted for the manufacturers to use movements which have been made in other countries. Movements made in Europe and Japan are recommended, as well as those from other countries, where the movements are made to meet the standards required by the “Made in Germany” mark. All materials and product components used comply with the legal requirements of the Federal republic of Germany as well as those of the EU, and, as far as possible, they come from German or European manufacturing sources. ELYSEE uses so-called 316L stainless steel almost exclusively, which is also used in machinery and aeroplane construction. It is forbidden to use “alloy” material, which belongs to the nickel alloy group. Naturally we comply with these regulations. The steel used is rust-free, extremely durable, the surface can be worked excellently well and it has a high-quality feel to it. An ELYSEE is given colour using ionisation. The watch is treated with ions in a wide variety of colours e.g. yellow gold, rose gold, black or in grey, so that the surface of the stainless steel changes. 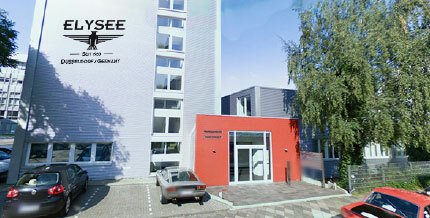 This technology from Switzerland produces the highest scuff resistance and is completely free from harmful substances. ELYSEE only uses toughened mineral glass or sapphire glass lenses. Even the toughened mineral glass lens is harder than steel, and therefore highly scratch-resistant. Sapphire glass is even harder. Only diamond or similar hard (jewel) stones can scratch sapphire glass. The majority of the lenses used by ELYSEE are anti-reflective. 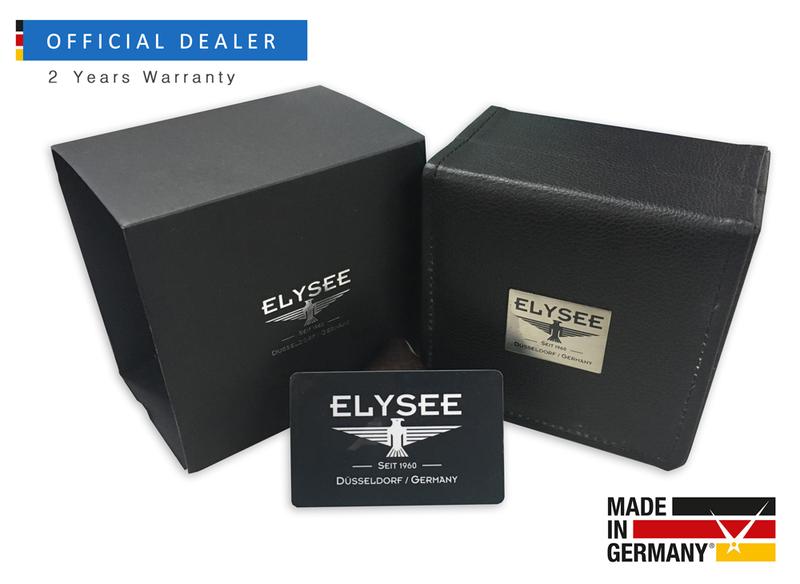 The leather straps used by ELYSEE are usually made from very soft, high quality calves’ leather and, of course, are free from toxic substances in line with the prevailing regulations. 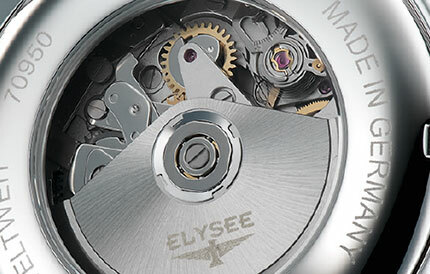 Many ELYSEE watches are fitted with a butterfly clasp. Sports watches are mostly fitted with a pin buckle. All crowns and pushers are sealed in the case. Some ELYSEE watches have a screw down crown. Often we use blued hands and/or blued parts. In the days when there were still no rust-free materials, metals were heated to a high temperature and then dipped in cold water or cold oil. Through this process the surface was “blued” and was rendered for the most part rust-free. We have revived this tradition for many watches. Many watches are fitted with these. The materials used by ELYSEE are completely harmless to your health. For watches which carry the “Made in Germany” logo of the Federal Association for Jewellery and Watches, only components which are technically and visibly flawless are used. They are produced according to the regulations of the traditional watch-maker’s craft. As proof of assembly in Germany, there is a label on the interior of the watch. This code is reported to the Federal Association for Jewellery and Watches and registered there.